1. By means of computer simulations it has been possible to define the natural pivot point of the system with unprecedented accuracy while achieving an optimum oscillation balance. The result: improved linearity, higher channel separation and reduced distortion. 2. Additionally, a new technique was developed and applied: slit less than 1 mm dia. hollow pole pins, thus significantly reducing eddy current losses caused by magnetic hysteresis. This sophisticated technology extends the frequency range and improves phase linearity. 3. 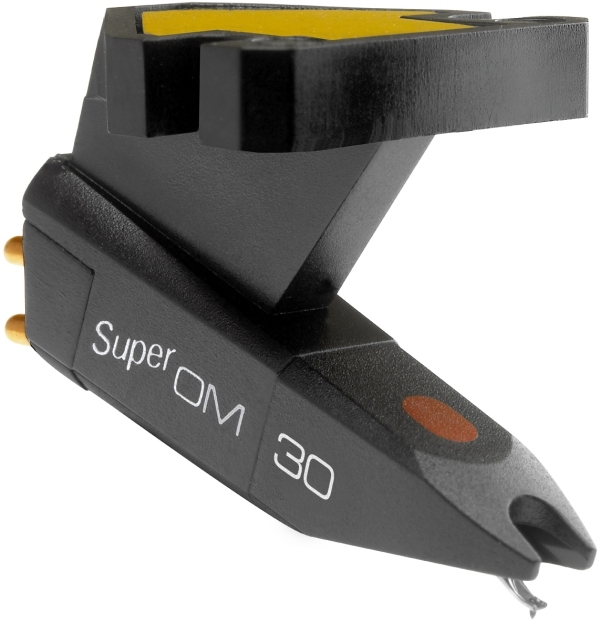 Thirdly OM Super cartridge body is manufactured from a Noryl (plastic & glass compound) which ensures high rigidity, and freedom from resonances. All Super OM models have the same body, construction and magnetic circurity. The only difference is the interchangeable stylus unit. We offer a wide range of replacement styli for the OM Super Series cartridges.